By Brian Braiker . Published on March 18, 2019. Remember when life was a meritocracy? 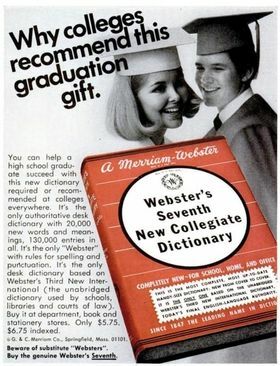 This 1969 ad brings it all back with refreshing wholesomeness: Webster's would like you to know that colleges recommended its Seventh New Collegiate Dictionary as a high school graduation gift. "You can help a high school graduate succeed with this new dictionary required or recommended at colleges everywhere," the ad copy says. But why stop at dictionaries? Last week, we woke up to news that dozens of wealthy parents, including a few celebs (insert "Desperate Housewives" joke here), had, through nefarious means, "recommended" certain colleges accept their special little high school miracles. This group stands accused of cheating and lying to get their kids into prestigious U.S. colleges—sometimes without their children's knowledge. One of the teenagers caught up in the scandal is Instagram and YouTube influencer Olivia Jade Giannulli, a 19-year-old student at the University of Southern California, and the daughter of "Full House" actress Lori Loughlin and designer Mossimo Giannulli, who have both been charged in the case. It's not often enough that one gets to experience true schadenfreude in this life, but this is one rare, gleeful instance. Here we have the superrich, expressing naked contempt for how most of us live our lives, brought low through hubris and general scumbaggery (which is not in the dictionary; we checked). Even if we did have the means to bribe our kids' ways into Yale—or (checks notes) the University of San Diego—we most likely wouldn't. Certainly, not when Webster's Seventh goes for a low, low $5.75 (roughly $40 in today's dollars, still a lot cheaper than graft!). And yet—aside from the thousands of worthy kids who lost possible spots to the offspring of these monsters—it's hard not to feel just a teeny bit sorry for the offspring of these monsters. Olivia Jade Giannulli, by all accounts, was not in on her parents' shenanigans ("tricky or questionable practices or conduct—usually used in plural"). With 1.4 million Instagram followers and 1.9 million YouTube subscribers, she was in on some brand love, though. Alas, no longer. The makeup collection bearing her name, Olivia Jade x Sephora, was canceled in a matter of days, just as the Hallmark Channel severed ties with her mother in the wake of the scandal. Which brings us back to Webster's. Perhaps the most delightful part of this ad is the warning at the bottom of the page: "Beware of substitute 'Websters'. Buy the genuine Webster's Seventh." Apparently collegiate fraud is nothing new after all.